The Chi Machine enables the human body to gently move from side to side in a figure of eight (the same way a goldfish swims), maximizing the body's natural absorption of oxygen, using all the movement orbits of the human anatomy. This movement may be compared to a masseuse holding your ankles and swinging you from side to side after a massage. Precise Oscillation - One Set Speed: The machine has an ankle cradle on the top which oscillates (moves from side to side), at approximately 140/minute - a multiple of the average pulse rate (72) and the cerebro-spinal pump rhythm (12) synchronized with your heart rate, blood pressure and spinal alignment - creating a balanced, rhythmic, relaxing wave-like motion throughout your entire body, thereby oxygenating every cell and tissue via blood circulation, thus enhancing your metabolic rate, aiding detoxification via the lymphatic system, aligning your spine and activating the autonomic nervous system. Daily oxygenation of your cells is critical - the original Chi Machine promotes this. Oxygen deficiency of the body is the proven foundation of multiple illnesses and diseases. Bacteria, viruses and parasites are destroyed in the presence of oxygen. 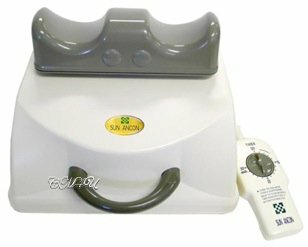 The Sun Ancon Chi Machine aids in maintaining physical wellness and thus the prevention of illness and physical disorders by maximizing supplemental oxygenation of your entire body at cellular level via physical stimulation - Passive Aerobic Exercise. Daily detox of your cells is critical - the original Chi Machine promotes this. Without daily physical movement the Lymphatic System cannot detox your body. Aerobic exercise oxygenates the tissues and moves the lymph around. Excellent benefits for the frail, physically challenged, seniors, wheelchair bound or bedridden. Due to its low impact operation, the Chi Machine is extremely valuable to those who through age or physical limitations, can't exercise. These people in particular benefit tremendously from the gentle massaging effect created by the oxygenating passive exerciser and its assistance in the movement of lymphatic fluid in the body. The machine relieves aches, pains and stiffness enabling seniors to be more comfortable and mobile. The Chi Machine 'work-out' is done lying down with no pressure, stress or tension applied to any part of your body. NO risk of injury. Heartbeat and blood pressure do not increase. NO stress to your spine, heart, muscles, ligaments, joints or lungs. Physical inactivity leads to depression, disease and decay. The Chi Machine not only gives back mental focus and energy to those who have 'lost it' or need a little help, but kick starts the body in general such as bowel movements become more frequent and sounder sleep is experienced.